Welcome to my astrophotography homepage. 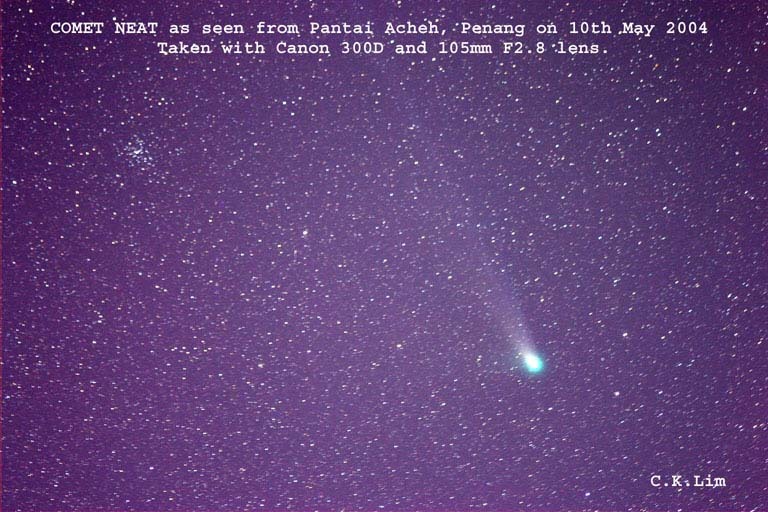 In this page, I will post images of astronomical objects taken with various cameras and telescopes. Some of the images, like the star trails, are so easy to take and do not even need a telescope. Most of them were taken from my backyard in Penang, Malaysia. However, there are some images that I have taken while I was on job assignment in the United States. Go ahead and browse through the subsequent pages. I hope you'll find these images interesting. To comment, drop me an email. Don't missed this golden opportunity to see this comet. It is currently a naked eye object at magnitude 3. Image of the Sun in H-a light. Click the image for larger size.